Public Law 108-183 required the Secretaries of VA and DOD to jointly review the mission, procedures and administration of the Veterans' Dose Reconstruction Program. It also required the Secretaries to jointly take action to ensure ongoing independent review and oversight of the Program including the establishment of an Advisory Board. The Board, which is known as the Veterans' Advisory Board on Dose Reconstruction (VBDR) meets periodically throughout the year. Meeting locations are determined based on Veteran demographic data provided by the Defense Threat Reduction Agency (DTRA) and input from Veteran service organizations. 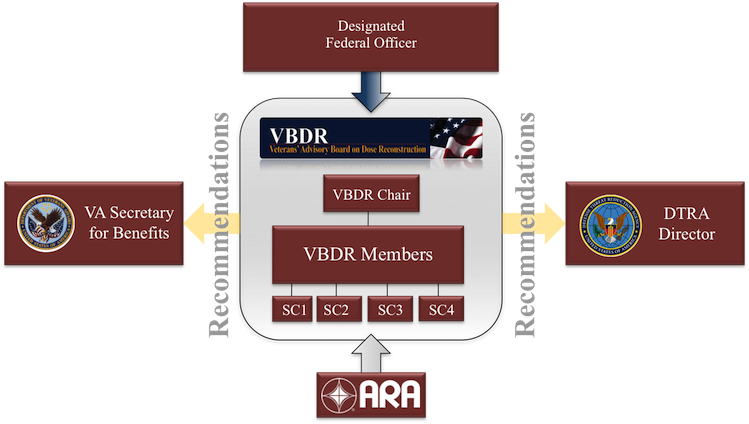 The agenda for VBDR meetings will be established by the Chairman in consultation with the Board members, the Designated Federal Officer, and the VBDR Program Administrator.